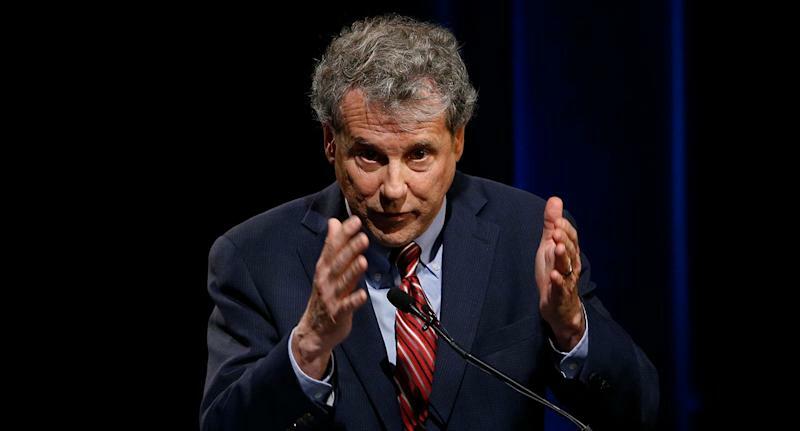 Sherrod Brown: The progressive Democrat who isn’t running on 'Medicare for all' or a 'Green New Deal"
The national media took note last year when Democratic Sen. Sherrod Brown, 66, cruised to reelection in Ohio, a state that backed Donald Trump by 8 percent in 2016 and otherwise voted for Republicans in all of 2018’s competitive contests, from governor on down. As a result of all the buzz, Brown started openly mulling the possibility of a presidential run. The senator’s flirtation with higher office will move into a more serious phase Thursday as he embarks on his first visit to Iowa, home of 2020’s inaugural nominating contest. The trip is part of a month-long “Dignity of Work” listening tour that will take Brown to all four early primary states, where he aims to find out whether the Midwestern populist message that has helped him defy Ohio’s rightward trend — fight for working-class people, regardless of race, without moving to the middle on social issues — can resonate with the voters most likely to decide the next Democratic nominee. On the eve of Brown’s three-day Iowa swing, Yahoo News interviewed the senator about his presidential plans — and how, if he were to run, he would distinguish himself from the rest of the Democratic field. For anyone familiar with Brown’s progressive credentials — he’s compiled one of the most liberal voting records in the Senate — the answer might come as something of a surprise: He won’t follow the rest of the pack in touting big ideas that sound good on the stump but stand little chance of passing Congress. Brown refuses, for instance, to be stampeded into endorsing “Medicare for all,” which he considers an unrealistic goal right now; he also regards the “Green New Deal” skeptically, as more of a bumper sticker slogan than a concrete platform. Yahoo News: You're about to start a listening tour of the early presidential states. What would you have to hear to make you decide not to run? Sherrod Brown: I don't know. I'm trying to go into this without judging what criteria we need for yes or a no. I just want to get a feel for these four states. I want to hear how people respond. Since November, when we first started thinking about running, my wife and I would listen to Democrats, and we would notice that too many of them think it’s a choice between running to our progressive base or talking to working-class voters. The problem is, if we choose between the two, we lose swing states. We lose Ohio. We lose New Hampshire. We could lose Pennsylvania or Michigan or Wisconsin or Florida. So it's pretty clear we need to do both. As you said, there are a lot of other Democrats running or gearing up to run. Are any of them already saying the sort of things you want to hear? I'm not sure they're talking to workers well enough. That's something the party needs to figure out. And it's not just talking to workers — it's governing as if you respect the dignity of work. For too long Democrats have not focused on these issues. We seem so happy about our success in the suburbs. But at the same time we’ve been losing the working-class areas by bigger and bigger margins. There are 88 counties in Ohio. I won 16 of them, and I won the state by seven points. But in many of those other 72 counties, we got emasculated. They weren’t even close. There’s this awful divide between the metro areas and the smaller towns. So I don't think the guy from Ohio's the only one who can win. But I do think that I can run a good race because of my message — and I'm sure that being from Ohio would help in the electoral college. What does the “dignity of work” mean in policy terms? And how does it differ from what other Democrats are offering, and have been offering, in recent years? It's not an attack on any institution. It's not an attack, per se, on Wall Street. I define the dignity of work as three things. One is better wages and benefits. Two is more power in the workplace for workers. That means stronger unions, period, and also workplace rules — legislatively in some cases — that give workers some freedom, the freedom to get a decent job, the freedom to use your skills, the freedom to have a predictable workday. And last, it's a tax system that rewards work. Right now, Congress and Mitch McConnell and the president and the courts all put their thumb on the scale of justice to advantage corporations over workers, or Wall Street over consumers. The idea of the dignity of work is to rebalance those scales so that people have a legitimate shot. You're often described as “authentic,” at least when you're not being described as “rumpled.” Seriously, though, authenticity is all Democrats can talk about these days. What does that word even mean? It doesn't mean that you have a consultant telling you to be authentic, because if you do —talk about being lost. I just think it's saying what you mean and meaning what you say. I've been consulted in race after race by fill in the blank — the DCCC, the DSC, whoever —to move to the center, to not speak out. Life's too short for that. If the facts change, you don't dig in on something that's wrong. But you do dig in on issues of justice. And as I fight for workers, I will always fight for women's right to choose, I'll always fight for marriage equality, I'll always fight for a higher minimum wage, I'll always fight for strong environmental laws, I’ll always fight for civil rights. It's who I am. If you ran, you might be the only candidate who doesn’t support full-tilt “Medicare-for-all.” Why not? It’s basically the password to get into the Democratic primary these days. Well, I'll start with this: I fought for universal coverage my whole career. I promised to pay my own health insurance until we got universal coverage — and I did. Now my wife and I are in the Obamacare exchanges, like millions of other people. I wrote the original Medicare at 55 voluntary buy-in. I wrote the public option, with Sheldon Whitehouse, that was originally in the Affordable Care Act. I want to get something done. I see too many 58-year-olds and 62-year-olds whose plants have closed going without insurance; they just have to stay alive until they're 65 to get it. I mean, I can do the talking points. I want to get to “Medicare for all.” But I think we can get Medicare at 55, and 55's OK with me too. Then we move towards “Medicare for all.” But I just don't know how it happens in this political climate. So you see it as a matter of realism? As in, how do Democrats actually cobble together 60 votes? The point other candidates are making is that the party should be setting “Medicare for all” as its goal. It’s aspirational. But I'm not going to change my philosophy and my positions to pass a litmus test. I'll put up my progressive bona fides up against anybody in this group. If all the candidates that you guys are writing about are in this race, I will be one of two people who voted against the Iraq War. I'll be one of two people who voted against NAFTA. I'll be the only person who has a long-term F-rating from the NRA. I've been pushing for marriage equality for 20 years. I don't need to jump when somebody says jump on any particular issue. And I've done all of that in a state where it's a lot harder than … pick your state, of the other candidates. Right. So I won’t be lectured to by other candidates about not being progressive enough on the issues. Just to be clear: You see “Medicare for all” as something America should aspire to, but to say that it’s your policy prescription does not strike you as a realistic way to proceed? What about a “Green New Deal”? That's the other hot topic on the left. Yeah, well, first of all, I don't know exactly what that means. The New Deal was a bunch of things put together: the Wagner Act, Social Security, the minimum wage, collective bargaining, Medicare. So I think the “Green New Deal” is a wonderful term. I think that climate change is the greatest moral issue of our times, and that we need to address it directly, and deeply, and consistently, and comprehensively. I think that there will be many components of what we do to address climate change, and I've been part of those efforts in the past. I’m getting the sense that your approach to policy — even in a Democratic primary — will differ from your rivals. Unlike many of them, you seem to resist campaigning on these big, bold catchphrases. Why? I came here to get things done. I believe in the Hubert Humphrey idea — inside/outside, with people on the outside pressuring people on the inside, and people on the inside doing the job. Here’s an example: For a while I was the only person in the Senate pushing to expand and make permanent the Earned Income Tax Credit. After we finally did it, some people came into our office and said to us, "Next to the ACA, it's the best antipoverty measure in 25 years." That might not have been a really salient campaign issue, but look at the impact it has on the pocketbooks of a lot of people making $30,000 a year. So I'll take that over talking points on any issue, any day. How about corporate PAC money? You’ve taken plenty of it in the past. But now it seems like every Democratic candidate is turning it down. Is that something you would do too? Well, I've thought about it. I may do that, I don't know. But the bottom line, again, is that I'm not going into this race thinking I've got to prove that I'm a progressive. I’ve represented a conservative congressional district; I've represented a state that's getting more and more Republican every cycle. And that’s just not how I operate. I’m not going to change my views just because I'm running for another office. Have you always considered yourself a populist? I think so, yeah. I start with this: Populism is not racist. It's not anti-Semitic. It doesn't divide people. Populists don't advocate tax cuts for the rich. To me, populism is lifting people up, and bringing people together, and giving them a chance in life. If you're working hard, you ought to be able to get ahead. If you play by the rules, you ought to have a decent standard of living. And if you love your country, you'll fight for the people who make it work. When I see some fascist dictator called a populist, or I see Donald Trump called a populist, it just rankles me. Because they're not. Phony populists go to meetings of rich donors to figure out their message — to figure out how to sound like populists. Well, nice try. I mean, why does anyone even describe Trump as a populist? Because he says he's “for people” and he has big rallies? So did Mussolini. At a time when gridlock has made getting anything done pretty much impossible and partisanship has divided us into warring tribes, I sometimes wonder if a person that wants to be president has to be crazy. Why would you even want the job? That's why I wrestle with it. Most of the people in this race now have thought about running for president for a year, five years, 10 years, their whole lives, or at least their whole careers. I know some people have come to the Senate planning to run for president. But it never occurred to me to actually do this until November, when I talked about our campaign in Ohio being the blueprint to win the White House. And then some people started applying it to me. I'm not saying there’s a groundswell; politicians don’t tell the truth when they say that. But I can see a path — and I'm thinking seriously about it. I wrestle with what it does to your family, what it does to your soul, to run for a year or two. I've just come off a campaign that was pretty long and arduous. There’s no whining on the yacht; I get to do this great job, so I'm not complaining about the workload. But I also know that it's sort of unnatural to dive into something like this. What do you feel like you could do as president that no one else could do? I've always had the courage of my convictions. I haven't compromised on principle. So I put my history up against anyone — my history of running in a conservative state as a progressive and sticking with it. That tells voters that I would continue to be that person as president. And I don't know if my colleagues will be that.